The most anticipated arrival for any Jet was definitely for defenseman Dustin Byfuglien this off-season. After a breakout playoff performance en route to the 2010 Stanley Cup with the Chicago Blackhawks followed by a breakout season with the Atlanta Thrashers in 2010-11, Byfuglien was toted to be one of the big names in Winnipeg for years to come. And his five-year contract in Winnipeg will make sure he will be a Jet for a while. With 53 points (20 goals, 33 assists) in 81 games last season, Byfuglien became one of the premier offensive defenseman in the NHL. However, his defensive play was suspect at times and, despite being the early favourite to win the James Norris Trophy in October and November, Byfuglien slowly fell out of the race with the Thrashers inconsistent play as Atlanta also fell out of playoff contention in the late season. But now in Winnipeg, Byfuglien is looking for another new beginning. And it's ironic since this is his third stop in three years. One of the only two Jets with a Stanley Cup ring (captain Andrew Ladd is the other), Byfuglien will be looked upon to be a leader on and off the ice with such a young team. The Jets are not very different than a team that Byfuglien helped win a Stanley Cup in 2010 when they were building to become a contender. For Byfuglien it may be the same situation in Winnipeg. Byfuglien has a slight connection to Manitoba, as he played 11 games for the Brandon Wheat Kings before moving to the Prince George Cougars of the WHL during the 2002-03 season. But it was in Prince George that Byfuglien caught the attention of many NHL scouts. His size and puck handling skills were of note to many scouts. Not many players possess the hands and speed of Byfuglien. Byfuglien was selected 245th overall in the 2003 NHL Entry Draft by the Chicago Blackhawks. In three seasons with Prince George, Byfuglien collected 140 points (47 goals, 93 assists) in 178 games. 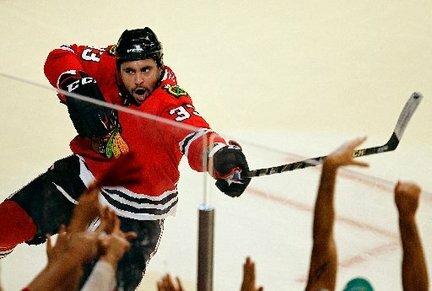 In 2005-06, Byfuglien made the jump to professional hockey, splitting the next three seasons between the Chicago Blackhawks, who eventually made him a full time winger in 2008-09. Byfuglien's versatility during his time in Chicago made him a fan favourite. Especially in the 2009 and 2010 Stanley Cup Playoffs. During the 2010 Stanley Cup Playoffs, Byfuglien scored 11 goals in 22 games, including five game winning goals. With 25 points in 39 career playoff games, the big defenseman will be looked upon to deliver in the leadership area as well as the experience area with the young Jets squad.